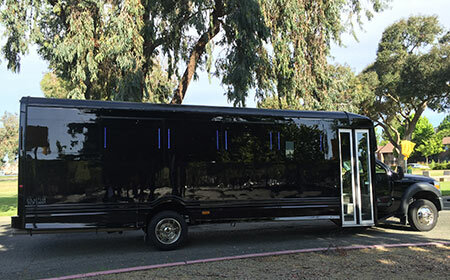 Million Services large-party Bus & Limousine Service is a leader in the Northern California Tour Guide Transportation Industry. We are a San Francisco Bay Area, Napa Valley & Sonoma Valley executive limo bus and limo rental service that is structured to fill all your chauffeured transportation needs, specializing in large-party tours of the Wine Country. We cover all spectrums of ground transportation service needs including sedans, limos, large-party buses and SUV limos. Our service area includes San Francisco, Oakland, Sacramento and San Jose Airports; and provide custom crafted, private Napa Valley, Sonoma Wine Country and San Francisco sightseeing tours. Whether your palate craves wine tasting in Napa Valley, Sonoma, Dry Creek, Healdsburg, Alexander Valley or Russian River, our Transportation Tour Guides can accommodate your needs, be it an outing with friends, a bachelor/ baccalaureate party, a , wedding party or newlywed couple on a honeymoon excursion or a corporate limousine/party bus function. With over 100 5-Star reviews on Yelp you can count on Million Services for your special event. Our state of the art, industry-leading fleet of vehicles includes and large-party buses, limousines, sedans, coaches, SUV’s and Hummers. Million Services Limousines: Ground Transportation for the connoisseur!